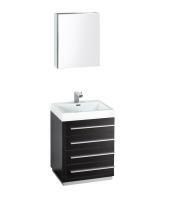 Not Included: Faucet, Backsplash, Linen Cabinet CAB02 17" X 17" X 60", CAB04 18" X 18" X 60", CAB05 20" X 17" X 57"
At first glance, this vanity and medicine cabinet combo appear almost clinical. Contemporary style fits function over form in this cabinet. Three drawers, a cabinet with inset frosted door and a matching medicine cabinet provide large storage space in a small package. You are terrific! I compliment you on your thorough service. You cover all bases: per-delivery-delivery and post delivery follow up. The sink has been installed. It looks great! THANKS!